Well I had some quiet time and a glass of wine and settled down after I had such a frustrating time with the computer this afternoon. 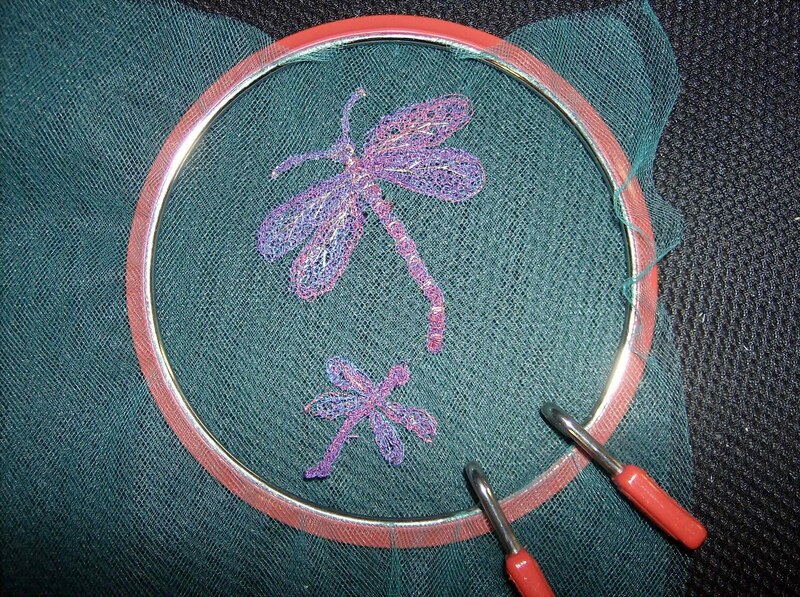 I was experimenting with some thread painting and worked on this dragonfly.The little one was my first attempt and the big one was my second. I think this has wonderful possibilities for additions to crazy patch.. I hooped two layers of tulle netting and used a varigated thread. When I was happy with that I used some gold thread and put in some accents by hand.I am totally excited with the idea........What do you think? I think it's a great idea, and looks wonderfully wispy, almost tangible, fragile, but beautiful. Thanks so much for sharing--it's sparked a few ideas. I am totally excited about your new idea. I love it. I LOVE DRAGONFLIES above all insects. They are so beautiful with the long wispy wings that are so transparent. They really say something to me. So glad you shared, I think I will be trying this out.